What do you do when your fighter jets are out of radio range in enemy territory? Normally, you'd use AWACS airplanes to relay communications back and forth. 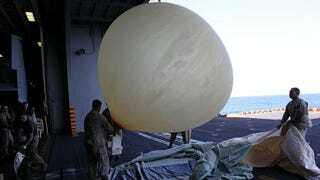 But, in the Libyan war, the Marines are using a new method: Weather balloons. The US Marines' AV-8B Harriers are now flying over Libya, along with F-15s, F-16s, F-18s, Rafales, Mirages, Typhoons, Tornados, and apparently Spectres and Warthogs too. The Harriers are out of range from their motherships' radio towers—in this case, the USS Kearsarge, now sailing the Mediterranean sea—so they took helium balloons, hooked them to a Lofted Communications System, and made them fly. Their new balloon gadget expands the transmission zone hundreds of miles, allowing the base and the jets to talk to each other using encrypted channels, without having to use precious AWACs resources.